A few weeks ago, amidst about fifty other exhausting things, I made it out of the house one glorious April afternoon to wander the north-campus parks area with my sister-in-law… just coincidentally wearing my dress version of McCall’s M7493. What version, you ask? Well, I would’ve sworn I blogged about it, but apparently (as happens all too often) I only wrote a draft, even more poorly photographed than usual, to the point where I didn’t have the heart to publish it. If you were following my Instagram (@tanitisis) back in, oh, February, you might have seen some of the terrible selfies. If not, please don’t go dig them up. 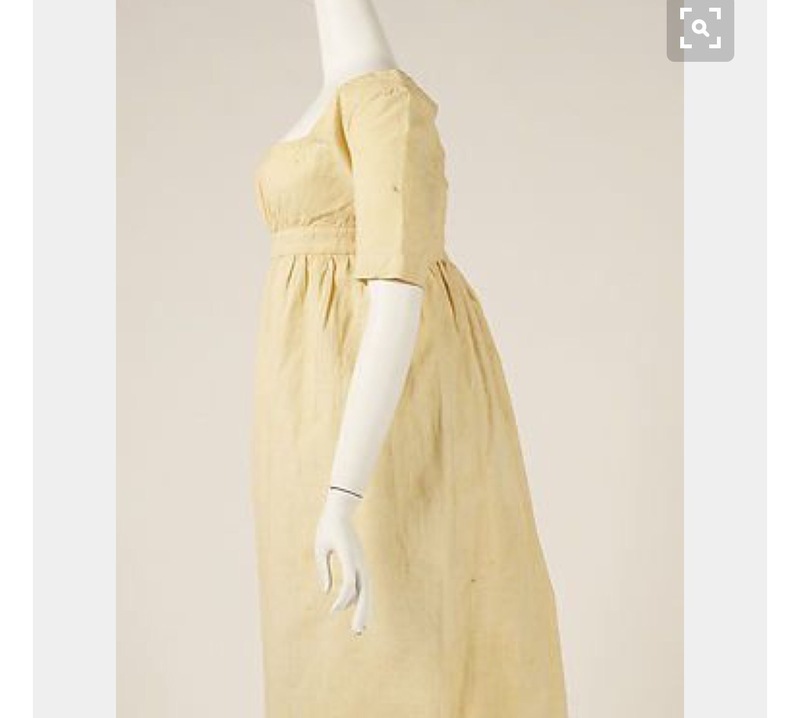 A border-embroidered fabric that seemed perfect for a Regency-style dress had come in at work, during that horrific post-New Years juxtaposition where all the stores start getting their spring and summer goods, but we Canadians still have two or three months of winter to deal with. What better way to avoid the reality of winter than a bit of historical fantasy, right? 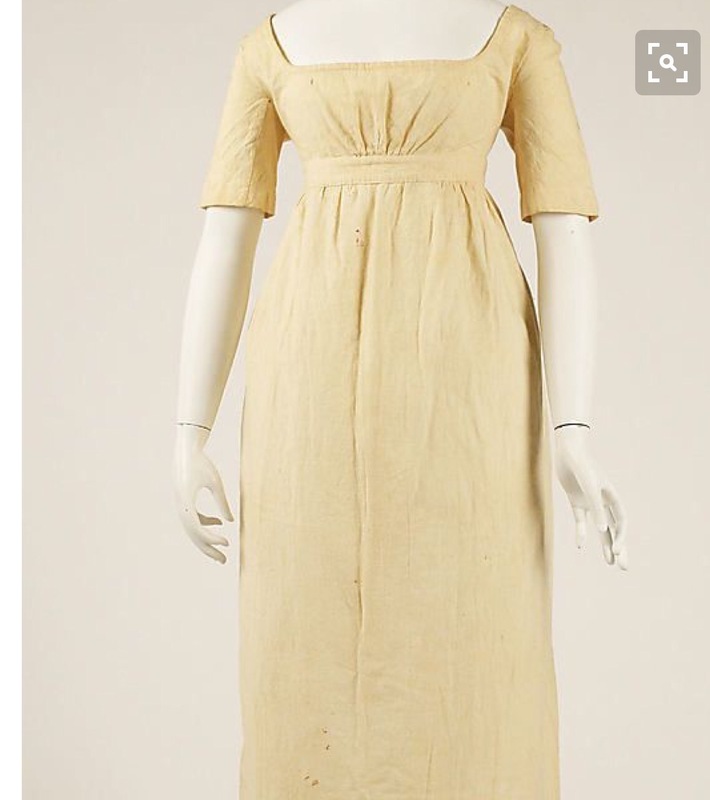 So, I decided to take the plunge and give the dress version of McCall’s M7493 (of Pride & Prejudice & Zombies fame) a go. The dress is not at all well illustrated on the envelope, but the line drawing looked cute. You may recall I made the coat for Syo’s Pride and Prejudice and Zombies costume last Hallowe’en. I am happy to report that the coat goes very well with the dress. 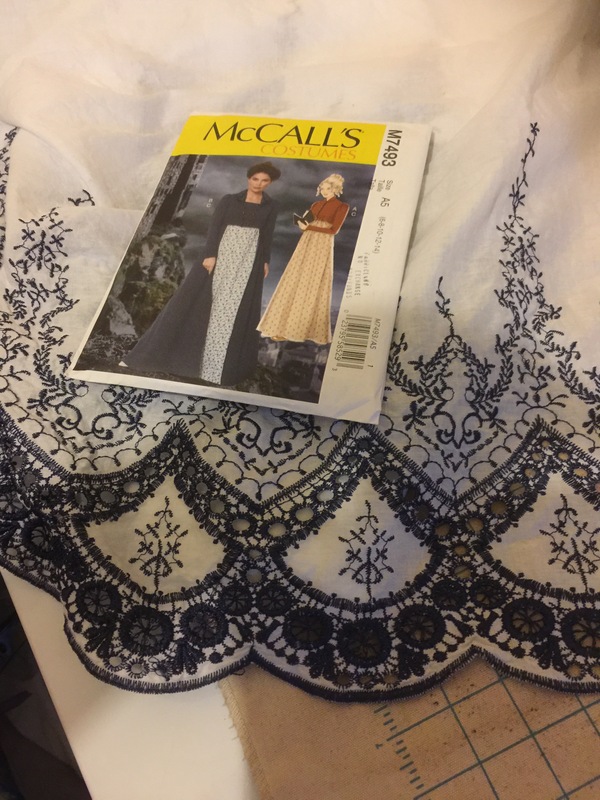 After checking the final measurements, I went with my proper size, 12—in McCall’s I often make a 10 as I tend to like the shoulder fit there better. But I wasn’t too concerned about wide shoulders here—the wider-set the better, really—and the finished measurements given were only 1.5″ design ease. Which is about right in my books. I actually skipped most of my usual fitting changes. 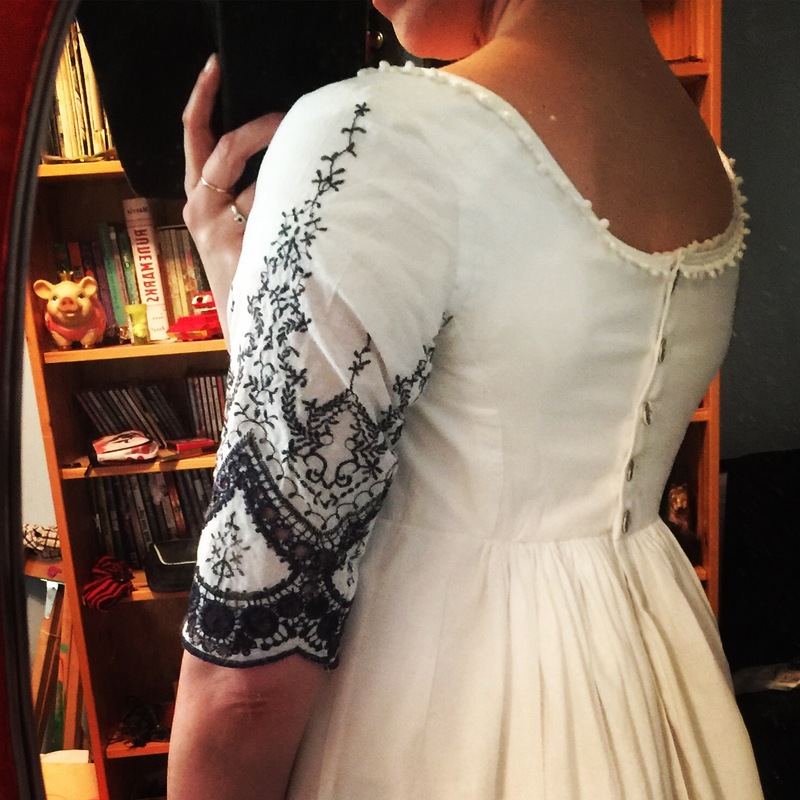 I didn’t shorten the bodice, I didn’t sway back (maybe I should have, not for actual swayback fitting but to give a more authentic line), and given the narrow shoulder I didn’t square that. I did raise the underarm by about 1 cm, to make up for not shortening the bodice, and I stand by that decision. I did make a few style changes. The most obvious is swapping in a straight sleeve to show off some more of the embroidery. I basically measured the width I would want (my arm + 2″, although I ended up narrowing it by 1/2″, so I guess I shoulda gone with my arm + 1.5″). I measured the length to the highest point, and then freehanded the rest; I wanted the sleeve seam to fall more to the back, although I’m not completely sure that’s correct for single-piece sleeves of the period. The main goal was for one of the spikes of embroidery to come up my arm toward the shoulder, and for the underarm not to be too deep. To my absolute astonishment, this actually worked. They went in amazingly well, basically first try. Most of the folds in the above pic are from my chemise (which has much wider sleeves) bunching underneath. Probably one could fuss a bit with the rotation, but, after picking my jaw up off the floor, I wasn’t going to mess with anything. The armscye is comfortably high and I can raise my arm quite well. 1) The shoulder seam is thrown to the back, as it should be for this period. Yay! 1) “Waistline” dips towards the back. Emphasized, no doubt, by my tilted torso, the back looks distinctly longer than the front. Period tendency is for the back to ride higher, like a bra that sags down in front. 😉 although the side-view of the same dress as above shows a slight dip to the rear. 2) the straight-hem problem. 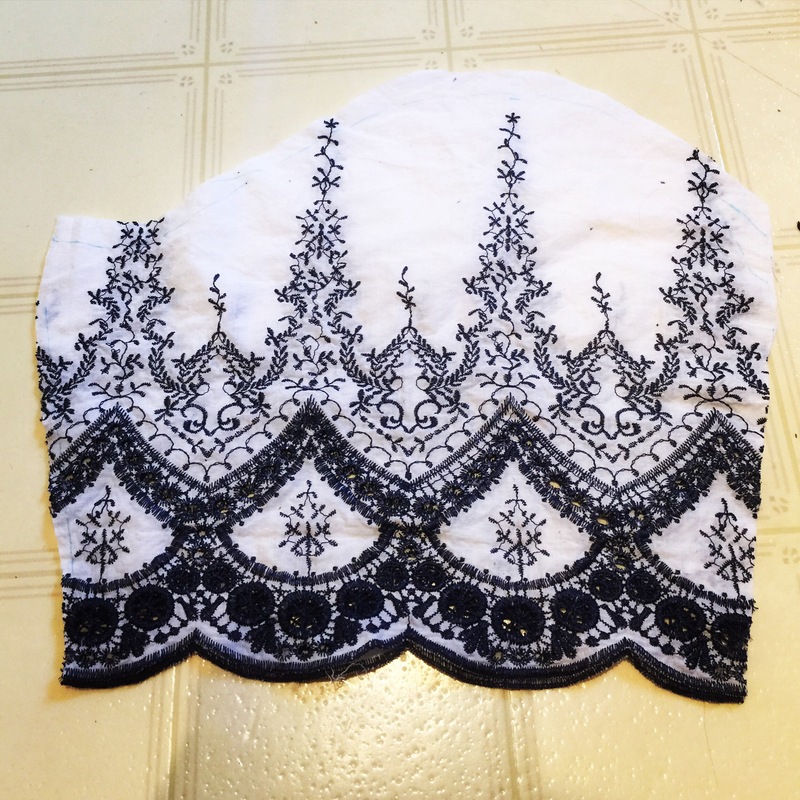 Because the embroidered hem is of necessity straight, while the pattern piece curved, the centre-front of the skirt is distinctly shorter, to the point where it shows a couple of inches of my petticoat. I was planning on making a different petticoat for this one anyway, and I knew the skirt would do that, so I’m not overly bothered, but there it is. Other petticoat is made and is short enough. Which means I have two different Regency petticoats, and only one Regency dress. As I wasn’t entirely happy with the slightly blousy bodice, I made a quick lace-up-front vest to go with, which I do quite like. I used the dress bodice pattern pieces, but kept the original dart (which I converted to gathers in the dress) itself. I lowered the neckline a bit, which I like; were I to make the dress again I’d lower its neckline as well, as I don’t quite have the “popping out the top” effect that so many period illustrations seem to show. I used fabric left over from the coat, and some of the satin bias binding I’d made for the coat as well—using up nearly every scrap, in fact. So I’ll call that a win. That pretty much sums up everything that needed to be said about the dress. However, I’m vain, and Angel Jems took over 400 pictures, of which only about 300 of them have my hair doing something weird or me making wonky faces, so I’ll subject you to a few more, including some better shots of the coat. We went all over the various parks north of the U of S campus, trying to find locations without too much obviously modern detritus. Railway tracks in the background are a little incongruous, I suppose. The coat twirls most excellently. The collar needs some encouragement to sit properly in its folds, but I’m pretty happy with it nonetheless. There is a LOT of fabric in those back pleats. I do wish there was a version or view of the full-length coat where the skirt met in the front. I couldn’t find any period examples of pelisses with a cutaway front like this. I mean, this coat is from the PPZ movie, so it had to be that way, and it wouldn’t be a hard pattern mod, but it would’ve been nice to just have it. See, great collar! Even if neither historically accurate nor screen accurate. Now why didn’t she tell me my ribbon was on backwards? Lovely use of fabric in the dress and the coat is divine. Your hair and ribbon combo remind me of Lady Harriet (Rosamund Pike) in the BBC production of Elizabeth Gaskell’s Wives & Daughters. The best photo I can find is on The Hairpin but it is such a rich vein of gorgeous Regency dresses I suggest you grab a copy of the series and spend the afternoon in costume heaven. Wow! Wonderful outfit! Dress amazing done in that fabric. Vest adds nice touch. Coat really is VERY cool. I’d like to see it worn more often! Photography, including selection of locations, is really well done! It is definitely dramatic! A bit of a pain to button and unbutton, alas. both pieces are gorgeous, love the use of that embroidered fabric and who wouldn’t want to wear that coat all the time! “Fun” fact: Relatives of executed nobles in the French Revolution wore thin red ribbons around their necks as a badge of honor, to quietly announce that they were in mourning for those who of their family who had been guillotined. Both dress and coat are absolutely gorgeous and you are the perfect model for them. So inspiring!